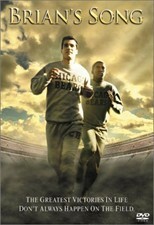 Mekhi Phifer and Sean Maher star in this remake of the heart-wrenching made-for-TV biodrama about Chicago Bears teammates Gale Sayers and Brian Piccolo, whose friendship is put to the ultimate test when Piccolo is found to have terminal cancer. Elise Neal co-star. 87 min. Standard and Widescreen (Enhanced); Soundtrack: English Dolby Digital Surround; Subtitles: English, Spanish, Korean, Thai, Chinese, Portuguese, French; theatrical trailers. One of the most popular made-for-television movies of all time depicts the true story of the inseparable friendship between fellow Chicago Bears running backs Gale Sayers and Brian Piccolo, and the tragedy they faced together. Co-stars James Caan, Billy Dee Williams, Shelley Fabares and Jack Warden. 74 min. Standard; Soundtrack: English Dolby Digital mono; Subtitles: English, Spanish, Portuguese, Chinese, Korean, Thai; audio commentary by Caan, Williams; featurette; trailers; biographies.